"A present je me suis emparée de Mister Cameron... nous façonnons avec lui ici un jardin en terasse avec bains en dessous, gallerie en dessus; cela sera de beau, beau, comme dit Maitre Blaise." It is well known that for centuries past there existed a constant cultural Iink between Russia and Western Europe. Italy, above all, from the fifteenth to the eighteenth century, France and Germany, even Holland in the early eighteenth, as also Spain - all exercised considerable influence on the development of Art in Russia. But that England, too, with her taste for the classical, had contributed to the formation of the outward aspect of the Petersburgian period of 1770 to 1820, is perhaps not realised. The influence of Gainsborough and Reynolds on portrait painting may have been noticed, but few in England know, for instance, of a painter such as was Borovikovsky. The expansion of English post-Palladian architecture, after Inigo Jones, of the Georgian period, introduced by Lord Burlington and developed as a result of the teachings of Clérisseau and others since 1760-1770, does not appear to have been observed either here or on the Continent. In reality, however, such expansion did exist, and found expression in a series of magnificent and characteristic buildings. If it did not create any school, this may be only because the simultaneous development of ancient Roman architectural ideals and the influence of the Renaissance as represented by Palladio, Sangallo, Sansovino and Julio Romano overshadowed Cameron. That influence, through Quarenghi and Brenna, and, earlier, Rusca and Gilardi, ousted the Adams and Cameron, and later resulted in a purely Italo-French Empire. Right: Approach to the Agate Pavilion, Tsarskoe Selo. This may be the reason why the period between 1770 and 1820 has been noticed so little. Brenna and Gonzaga virtually overcame Cameron, and if he left no followers, he certainly did leave a mark, as indelible as it is exquisite, not only in architecture, but also on decorative art as well as in landscape gardening. Cameron remains one of the greatest exponents of British taste and British Art abroad, and if he has been so completely forgotten in his own country, it would seem only right to rectify this omission and give him the place he deserves in the history of British Art. "L'impiratrice de Russie Catherine la Grande plus que toute autre se montra I'admiratrice de l'antique et par ses commandes en aida le triomphe." "Comme aucune gloire n'est plus evidente, plus monumentale dans tous les sens du mot que celle conferée par les grandes entreprises architecturales, Catherine pardessus tout aimera la batisse." Vigiée-Lebrun, Madame Elise-Louise, Souvenirs, vol. I, P- 312 . Paris, 1869, 2 vols. Catherine soon realised that Russian architects could not satisfy her passion. They were not sufficiently familiar with the only style that she appreciated, the new Classical Revival. So she established the Institute of Laureats of The Academy of Fine Arts in order to arrange for young Russian architects to study in Rome and in Paris. Some of them even went to England to study Inigo Jones and the more recent imitators of Palladio. It was thus that Neelov and his son. who were attached to the Tsarskoe Selo Palace, were commissioned to visit Great Britain. Their first task, when they returned in 1778, was to reproduce in the park of the Palace the English copies of Palladio's famous bridge. Of other contemporary Russian Palladianists, the most noteworthy are Starov and Bazhenov. Lvov's Russian edition of Palladio's work had already been published in 1772. Left: the Agate Pavilion, east side. Also showing the Ground Floor, where the Baths were situated, and part of the Vaulted Ramp. For major work, however, none of these Russians seemed good enough, so Catherine tried time and again to get hold of foreigners. Charles l. Clérisseau (1721-1820) was one of the first to be invited. This pupil of Pannini had an extravagant imagination and composed vast and most phantastic projects. Nothing of what he designed was executed, but later, Catherine's architects, like Quarenghi and especially Cameron, derived much inspiration from him. It is for this reason that he must be remembered. These architects were Giacomo Quarenghi and D. Trombara. Quarenghi became one of the central figures in the Classical Revival in Russia; Trombara, worked mostly in the provinces. When they first arrived, they found Cameron already installed in St. Petersburg. 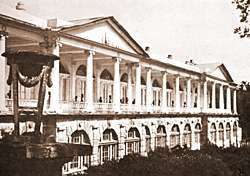 On other constructions by predecessors and later collaborators of Cameron at Tsarskoe - Stariye Gody, July/September, 1911, and Viltchkovski, Tsarskoe Selo in 1910. Left: the Agate Pavilion, Tsarskoe. The columns are of agate with bronze capitals. Very little is known about Cameron's early life. He is supposed to have been attached to the Roman court of the Young Pretender. He certainly knew Rome well and studied the monuments of antiquity in great detail. Drawings dated 1764 are preserved at the Leningrad Institute of Engineering. The place and exact date of his birth, his family circumstances, the years of apprenticeship and work in his youth - in other words, all that may have been responsible for the forming of his leanings towards Art and Architecture and their development, remain unknown. A Scot by birth and a follower of the Stuarts by inclination (which explains Catherine's calling him a "Jacobite"). Cameron has hardly been studied at all in his native language. Prof. A. E. Richardson, in his articles in the Architectural Review, mentions some of the palaces built by him, but does not give the dates of his return to England, or of his second journey to Russia. Graville, in his Guide to St. Petersburg, mentions Cameron, but a number of dictionaries on architects do not speak of him at all, or very little (Summerson, Nagler, Fussli, etc.). Even Fomine, in the Exhibition of Architecture, 1912, says very little (pp. 24 and 54). All endeavours to obtain in England more information than is contained in the dictionaries of Nagler, Fussli and Thieme-Becker were unsuccessful. However, it is presumed that Cameron was born in 1740 or 1741, and died in 1812. Igor Grabar, in spite of lengthy research in the archives of the Ministry of the Imperial Household, could not confirm these dates. W. Kurbatov, in his description of Pavlovsk, also quotes 1812 as the year of Cameron's death, and although a number of other authors mention even 1820, T. Tchernavin states that he died in St. Petersburg in the spring of 1812, his obituary being published by the Gentleman's Magazine in June of that year. In any case, in November, 1812, Cameron's library was sold by an auctioneer in St. Petersburg with the unbecoming name of Jean Grabit. It is thus that in the summer of 1779 we find Cameron in Russia. At first he lived in Tchernyshov's house in St. Petersburg, but a little later he moved to Tsarskoe, where he was given a house to himself, arranged according to his own taste. (That house, unfortunately, was later taken away from him by Paul I, after the death of the Empress). For the next twenty years plenty of dated and documented evidence survives, but for Cameron's last years, however, we are regrettably in the dark. After Catherine's death he appears to have lost the favour of the Court. Paul I certainly did not commission work from him comparable in magnificence with what he had done before. It can be assumed that between 1799 and 1801 he was back in England, but returned to St. Petersburg after the death of Paul I. In 1802 we find him in Kronstadt. In 1803 he was asked to undertake the work of restoration, after a fire, of Pavlovsk Palace, one of his earlier masterpieces. In 1804, he worked on projects for Kronstadt Cathedral, but in 1805, the Minister for the Navy proposed to Count Strogonov to replace Cameron as architect for the Admiralty by the younger A. Zakharov. There are also documents showing that in 1811, when Zakharov died, Cameron had some difficulties, but worked again In Pavlovsk. After that date, however, all traces disappear. He was offered the position of Chief Architect to the Admiralty. A considerable number of documents of the time show that Cameron, apparently having previously learnt his lesson, now became more independent and accepted the position on his own terms. In 1820, acting under the instructions of the Emperor Alexander, the Russian Ambassador at the Court of St. James, Prince Lieven succeeded in acquiring from Cameron's next-of-kin in England, 114 drawings (for £105, as against £200 asked for, yet quite a considerable sum at that time), which were used by Stassov for the restoration of Tsarskoe Selo after a fire, and have since been preserved at the Hermitage. Right: The Stairs of the Cameron Gallery. In 1801, or a little later, when the Emperor Alexander was already on the throne, Cameron returned to Russia and was appointed architect to H.M. Cabinet (Crown Property Department), and three former assistants were given back to him. He drew up a plan for the gateway at Tsarskoe, and even returned to Pavlovsk, where he built the pavilions in the gardens. He was evidently reestablished after the period of disgrace and obscurity between 1796 and the end of the century. He conducted and supervised a number of projects, but his position was not easy, as in the meantime new and great Russian and foreign architects had appeared - Voronikhin, Zakharov, Rossi, Brenna, Luccini, and in Moscow, Giraldi and Kazakov. Yet everything built for the Admiralty at Kronstadt (for instance, a hospital and barracks), or in the provinces, at Nikolaiev, Kherson, Astrakhan, and in Finland, rested with him as chief supervisor. But he was already over sixty, and no longer equal to his tasks and the adverse criticism of a younger generation. In short, Cameron's brilliant period began about 1779-1780, and continued for some twenty years, until Catherine's death in 1796. His talent blossomed particularly at Tsarskoe Selo and at Pavlovsk, which name indeed became inseparable from his, as also in the Provinces (Batourin, etc.). The second period, somewhat of a decline, dates after his return from his brief visit to England in 1801, and lasted till 1811. 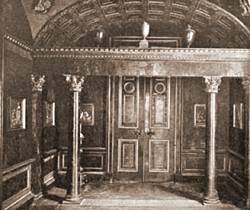 Yet in that latter period his genius and skill, instead of being called upon to create things beautiful such as palaces, baths, etc., were applied to more practical purposes. Among these were, as already mentioned, a hospital and barracks at Kronstadt, as well as some administrative and other buildings there and in Pavlovsk, also doorways and annexes. For an experienced and gifted architect most of these works were of little interest and hardly worthy of his genius. 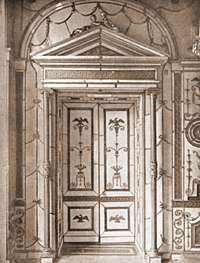 Left: An ante-chamber, Tsarskoe. Cameron's first work. The pilasters are of carved wood. Such, on the whole, was the life of this great architect, whose portrait depicts him as a young, pleasant and amiable gentleman. But life, with its petty jealousies, the meanness of others, especially of his Italian and German co-workers, had changed him, apparently made him rather quarrelsome, compelled him to defend his name and fight for his own financial interests. "A Catalogue of a Library consisting of precious books on Art, Science, History, et cetera, in the various Languages of Europe, left after the demise of the late Mr. Ch. Cameron. Of a collection of pictures, of three schools, engravings framed and drawings in a folder. Also an assortment of instruments mathematical and astronomical, left after the said demise and that of the late MR. Schroeter; (NOTE: Cameron's assistant, later of the architect Voronikhin.) and various other articles, such as porcelain, furniture, etc., etc. The sale of all of which shall take place during November, 1812. Printed by Alexander Pluchart,comp. 1812-72. Title and 209 pages." 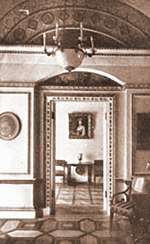 Left: A doorway, Music Room, Tsarskoe. The single copy of this catalogue of Cameron's library and of his other art treasures is a great rarity and is now at the Rumiantsev Museum in Moscow (now called the Museum of Old Eastern Art). Cameron's lot, after his death, was trying. Apart from the bibliographical interest this catalogue represents, it proves the indifference of contemporaries, compatriots, and even next-of-kin and colleagues to an exclusive talent. Soon after his arrival in St. Petersburg, Cameron was commissioned to build a Chinese village in the park of Tsarskoe Selo. 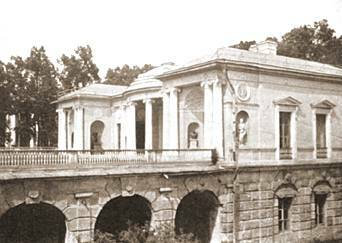 Neelov had just completed his Palladian bridge and a theatre. The village was designed in imitation of Chambers, whose book on Chinese Architecture, published in 1757, Cameron no doubt knew. The village was never completed, and later Paul I even wished to destroy what had been done. So she asked Cameron to redecorate three suites of rooms for her: in 1780-1782, the First Apartment (now known as that of the Empress Elisabeth Alekseyevna, consort of Alexander I, who lived there from 1815 to 1825), not yet made of such lavish materials as the later ones. It consists of an Antechamber, the green Dining Room, Blue Chinese Room, Bedroom and Music Room. 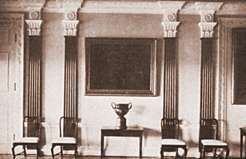 The First Apartment was followed by the Fourth (1781-84) with the Chinese Hall, Salle des Arabesques and Salle de Lyon, and the Fifth (1782-84) with the Silver Cabinet, Blue Tabatiere, Mauve Bedroom, Boudoir, the Raphael Room and the Cabinet of Mirrors. 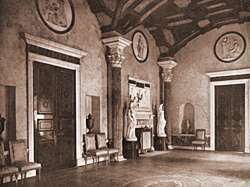 From the staircase, now replaced by the Chinese Hall, the Salle des Arabesques and the Salle de Lyon join on to the great reception rooms; on the other side, the Silver Cabinet, the Bedroom, the Blue Room and the Cabinet of Mirrors lead, in the left wing, to the Colonnade. 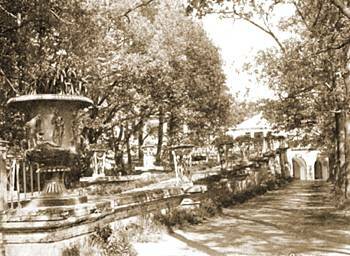 Right: Bronze capitals crowning carved marble columns. Later he built the Agate Pavilion and the Colonnade. From 1782 to 1787 he was engaged in the building of the St. Sophia Cathedral at Tsarskoe, his only religious structure. 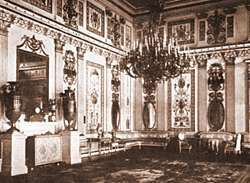 Right: The Arabesque Hall at Tsarskoe. Now Clérisseau had been the chief draughtsman to the Adam Brothers in 1757 to 1762, and the influence of Adam's style on Cameron's is indeed obvious. Comparisons can easily be drawn between Tsarskoe and Pavlovsk and such works of Adam as Lansdowne House, Kenwood and Osterley Park. The similarities are, as one would expect, most marked in Adam's buildings of the seventies. His later, 20, St. James's Square, shows already a parting of the ways. Obviously, Cameron himself realised that he depended on the work of Palladio, and Russian biographers, who have had occasion to compare the drawings of Palladio in the collection of the Royal Institute of British Architects with the designs of Cameron himself, testify that he borrowed from the great sixteenth century master. He also drew largely upon the collection of designs and drawings brought by Lord Burlington to London from Vicenza. Possibly this was the most important influence on his career and the starting-point of that interest in the Roman baths which played so great a part in developing his art. However, the drawings of the baths of Agrippa, Nero, Titus, Domitian, Trajan, Caracalla, Diocletian and of Constantine, although not his originals (for he himself admitted that they were only those of Palladio "corrected and improved"), brought remarkable results. just at that time artistic taste had developed markedly in Russia as well as in other European countries, and reverted to the classic style. The baroque of Louis XV had proved disappointing, and there was born a desire for more sober and harmonious forms, founded on the classic art of ancient Greece and Rome. However, in spite of inspiration from Adam and Clerisseau (Cabinet of Mirrors), Cameron displays everywhere his own personality and taste. In the Bedroom, for instance, he used the elongated lines, columns surmounted by small capitals, and archlike garlands of Pompeian frescoes as neither Adam nor Clerisseau would have done. In order to give the effect of the long perspectives of the frescoes, Cameron placed mirrors between the columns. To this device he added yet another. Trying to imitate Pompeian panels, he covered the walls with Wedgwood plaques. Catherine was, as is well enough known, one of Josiah Wedgwood's most regular and important customers. Above: Two Views of Catherine's Private Apartments. 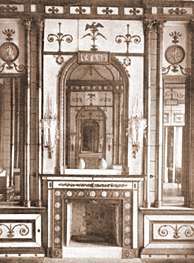 Another characteristic of this room, as well as of the adjoining Tabatiere and the Cabinet of Mirrors, is the quest for polychrome materials. 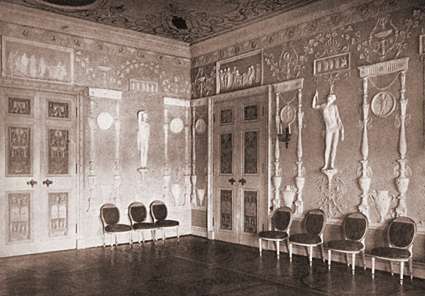 The walls are covered with milky glass, over which are placed eagles and sphinxes in bronze, Wedgwood medallions and columns of violet glass. The next, the Blue Room, has the same milky coloured plaques, but blue columns and bronze medallions.